If you stay inside all winter, sipping coffee and waiting for warmer weather, you might be missing some of the best bass fishing of the year. That�s the opinion of eight-time B.A.S.S. winner Mike McClelland, who most recently won the first Central Open of 2017 on Table Rock Lake. That doesn�t mean it�s easy. When McClelland talks about winter fishing, he�s referring to when it�s �bone-chilling cold,� and if you�re not prepared, you will suffer, you may get hurt, and you likely won�t catch many fish. First, the Bass University instructor cautions that you�ll need to gear up properly. If he�s fishing alone, he�ll wear a Mustang inflatable PFD at all times. He wears insulated footwear and dresses in layers. Most importantly, he keeps an extra set of clothing on the boat in case he happens to fall in. No one plans on doing that, but you should plan as if it might happen. Other than when fish are offshore in the heat of the summer, this is the time when McClelland relies on his electronics most. He uses Garmin units and trusts them completely, especially the Panoptix feature, which allows him to see 100 feet out in any direction. �Don�t start fishing in the winter until you locate what you�re looking for,� he said. That could mean bait, or bass, or even brush. He focuses on high percentage areas like channel swings, bluffs and transition areas where the bottom composition changes. He�ll also look for dark surfaces, like dock floats, that hold heat. Finally, unlike other times of year when he often prefers long tapering points, during the winter the Ozarks expert likes shorter, steep points. While the fish are often lethargic in cold water, that doesn�t mean you always need to drag a jig or finesse bait around. McClelland�s favorite tool for this time of year is a crankbait, specifically the SPRO Rock Crawler, which looks quite a bit like the Original Wiggle Wart, but gets down much deeper. He said he can tickle 14 feet on a long cast with 6- or 8-pound fluorocarbon. It�s available in classic custom colors and makes a clicking sound like a real crawdad. Most of all, he said he can pull it as well as crank it to tempt bass, so it�s �essentially like dragging a jig around.� He fishes it on a 7-foot medium-action Falcon Rod with an 80/20 or 70/30 action and never goes faster than a 6.3:1 gear ratio on his Cabela�s baitcasting reels, and most of the time he sticks with 5:1. Another key tool is a hard stick bait, which �allows me to fish a bait as slow as you can possibly fish a bait and still have an opportunity to catch fish in extremely cold conditions.� He uses a variety of models from SPRO depending on the size of the baitfish and the depth he�s trying to achieve. He noted that the lures� ability to suspend varies with water temperature, so he�ll check each lure first thing in the morning and adjust the hook size or otherwise weight the bait to make sure it sits properly. When he stops it and it�s 8 or 9 feet deep, he wants it to stay 8 or 9 feet deep. One thing that distinguishes his jerkbait fishing is that he tends to throw it in slightly dirtier water than many other anglers, changing to more opaque colors to garner bites. He noted that even in cold water, a lot of bass stay shallow, so he�s not afraid to go there either. When conditions are toughest, he�ll go to a jig, usually either a football-head or a ball-head model, although occasionally he�ll go to a casting head. You don�t want a lot of action this time of year, so his favorite trailers are a Big Bite twin tail grub or a Ditch Craw. The key, no matter what, is to go �as slow as you can possibly throw it� and to use the lightest jig with which you can effectively maintain contact with the bottom. The bites are often �pressure bites,� and the biggest mistake you can make is to set the hook too hard. Most of all, the key is be aware not necessarily just of water temperatures, but �about what the temperature has done on the days prior.� If it�s been on a warming trend, expect the fish to be more aggressive, and if it�s going in the opposite direction, prepare to add a little more finesse. 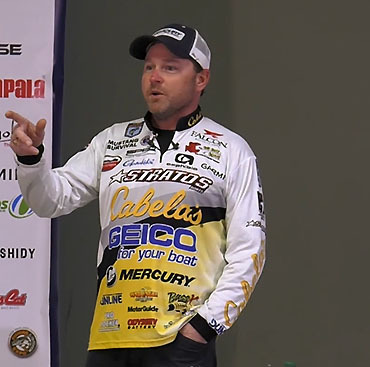 If you want to learn some more of McClelland tips, including his cold-weather swimbait choices and how winter bass fishing sometimes replicates crappie fishing, check out his full video, available only by subscribing to The Bass University TV.